From times immemorial Shiva and Shakti demand reverence of Indians. The author has widely covered all temples of Shiva and Shakti traveling from the Himalayas, the abode of Shiva, in the north, to Kanyakumari in the South. 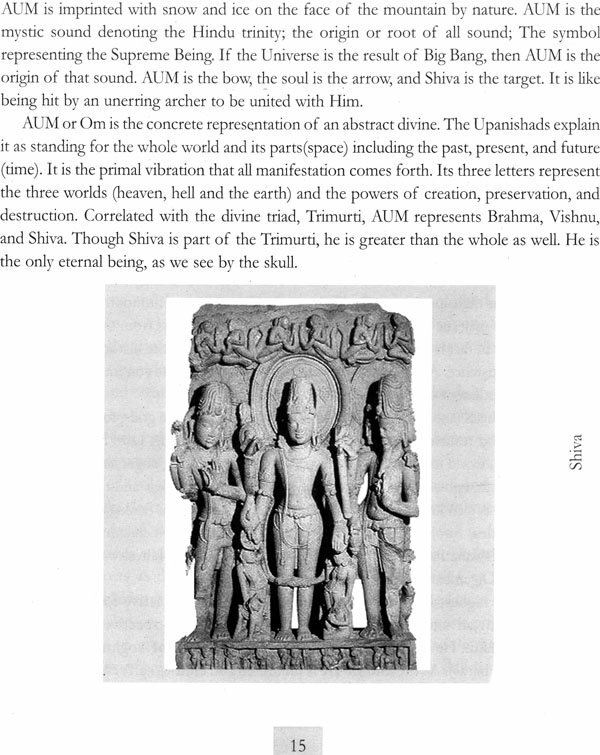 Brahma, Vishnu and Mahesh constitute the great triad of Hindu pantheon. Brahma the creator, Vishnu the preserver and Shiva (Mahesh) the destroyer of the Universe. Shiva holds the trident, the emblem of his supreme poer, representing the three gunas- satva, rajas and tamas - through which he commands the world. He alone is the God of death and resurrection of the flux of being and non-being. The word Shakti means poer, valour of vital energy. According to Indian mythology, spiritually shakti is regarded as Goddess - consort, queen of a deity and also God's active and dynamic form. Shakti represents the fundamental creative instinct underlying the cosmos and is the energizing force of all divinity. The entire universe is perceived as being created, penetrated and sustained by two fundamental forces, which eternally exist in a perfect, indestructible union in the Tantric Cosmology. 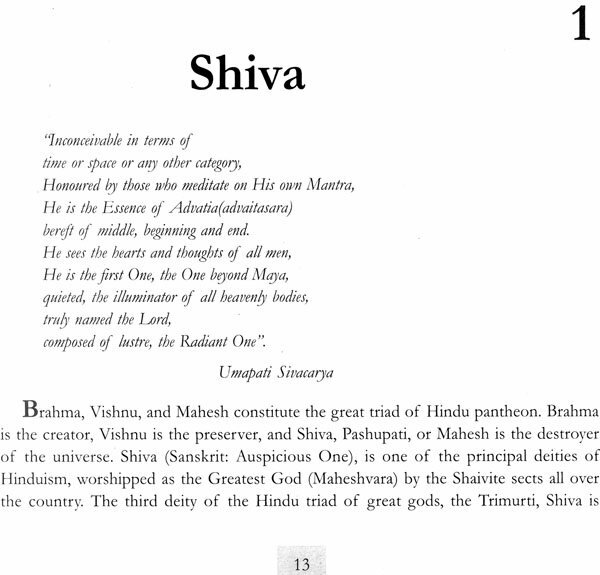 These principle forces or universal aspects are known a Shiva and Shakti. Whether Shakit as Primal Energy originated before Shiva, who is radiant consciousness and has no origin or end or Shiva as Chaitanya originated before Divine Energy is rather a mystery. 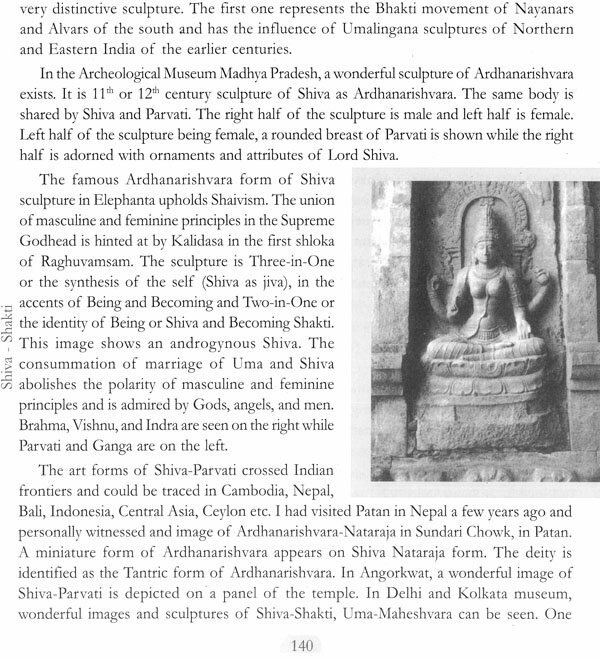 The sculptures of Shiva and Shakti are sensuous yet sacred. 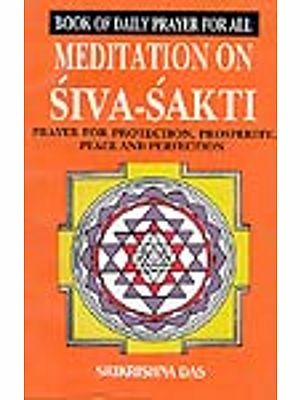 The present volume attempts to solve the mystery that the contradicting characteristics of both Shiva and Shakti pose for interpretation. Mandira Ghosh is a post graduate in English literature. She has already few published works of varse to her credit. She has received many awards for her contribution of poetry in India as well as abroad. Through this work Mandira Ghosh has tried to arrive at a point where science meets philosophy and other branches of Humanities. She has also tried to immortalizes folk music of the Himalayan ranges since the centuries. She has collected the various verses from different ranges of the Himalayan belt and concludes that the music unites both hearts and soul. The exactness of science and the fantasy of poems do not usually go together. But Mandira Ghosh has experimented with both, interspersing poetic diction with mathematical terminology. She uses scientific balance and poetic language to express her thoughts. Lord Shiva and Shakti are revered by all Indians and I am no exception. When I was a small girl, I had an opinion that Durga was Bengali. She came every year in my locality to belss us, along with Her children (Shiva was hardly present in the idol and His non-existent image made the children of our locality conclude that she was single). Four days of divine leela used to come to an end and made us remorse on Vijayadashami, when she along with Her children were immersed in the river Yamuna. The day I came to know that she was daughter of the Himalayas and resided in the northern Indian while Bengal was in east, I was extremely disheartened. Brought up in a cosmopolitan atmosphere where I befriended people from all parts of the country and the world, I realized the meaning of Sanatana Dharma at a very early age and learnt to respect all religions. To complete three of my projects (Folk Music of the Himalayas, The Cosmic Dance of Shiva, and Shiva Shakti) my visit to the Himalayan ranges, Uttaranchal (both Kumaon and Garhwal areas), entire kingdom of Nepal, Shaivite temples in the Kaveri belt of Tamil Nadu, Nasik, Trembekeshvar in western India and several other places helped me to comprehend and explore what exactly Hinduism interprets. Being a student of science, and also a student of Mathematics I have studied religion from a scientific angle. I was a near atheist at a time and considered rituals, Tantra, mantra, and yantra as superstitions till I met some sages who changed my outlook towards life. The term Himalayas spread vibrations in my body. I have spent hours in Haridwar, dipping my feet in the holy water of the Ganges, in Har-Ki-Pauri, my most favourite place on earth. In the foothills of the Himalayas in Garhwal, in Kumaon ranges it is indeed an unparalleled sight to watch temples, pilgrimages of Shiva-Shakti soaring into cosmic blue. The book was born with my recorded experiences of visiting south, when I walked among the simple and honest people of the south, among girls giggling with flowers in their oiled hair, among the melodious carnatic music, in the huge expanse of Madurai temple, worshipping goddess Meenakshi, worshipping jyotilinga at Rameshvaram and drenching my body in rain near the Indian ocean. Madurai is a throbbing city and entire city life revolves around the temple and in the Himalayan kingdom of Nepal, life revolved around the Lord Pasupatinath. Situated in the heart of the heaven, Lord Pasupati has transformed only Hindu kingdom on earth into a secular state. Then Hinduism and secularism are synonymous. But still I feel the term, 'one', 'single', and 'unique' have a unique charm of its own. I have consulted innumerable books to write this book. I am grateful to all intellectuals who have penned on Shiva and Shakti and it is very interesting to note that many of them are foreigners. A branch of philosophy must be highly developed or otherwise would not have been regarded by millions of people all over the world through thousands of years. Shaivism and Shaktism are proved and show results and thus are not only spiritual but also scientific. I have visited museums all over the country and collected facts. 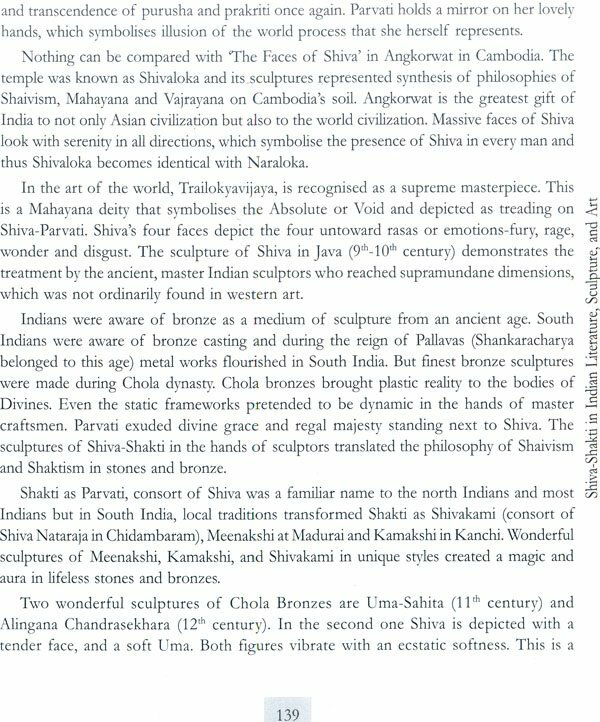 A portion of chapter Shiava, I have penned during the week and on Mahashivaratri (26th February 2006). Instead of visiting the Shiva temple at night, I went in the morning and watched live telecast on Shivaratri from all parts of the country in television entire night. Cameras (capturing the earnest devotees) jumped from one jyotilingams into another within a fraction of second and it is indeed a fascinating sight to watch devotees pouring into the temples throughout the night to abishek Shivalinga. Shakti portion I have tried to pen during Navaratris (beginning from 29th March 2006). This time I used to get up early in the morning to have glimpse of Devi. As I began to write about Shakti on the first day of Navaratri (Nine days starting from 30th March) I watched the same enthusiasm in the people as must had been ages ago. People were shouting Jai Mata Di (Hail O Mother) and gushing towards Vaishnu Devi Temple (Jammu), Kalka Mandir (Delhi), Jawala Mukhi and other innumerable temples with great devotion. During my visits to Garhwal and Kumaon, it was heartening to watch the temples of gods and goddesses amidst the picturesque Himalayan ranges. It must be heartening to watch the temple of gods in once heavens-Kashmir and Nepal. Television is no doubt a wonder of science but nothing can be compared to my visits to hundreds of temples dedicated to Shiva, Shakti all over India and also in Nepal. When my publisher, Mr. Sanjay Arya entrusted me with the subject I readily agreed. I was keener on writing on Divine Energy as looking at the condition of women around I wanted to explain that according to the scriptures, Shakti was the Supreme Power. Every individual is masculine and feminine. Root cause of the degradation of woman in our society was that women were considered prakriti, or inert matter and purush as consciousness. In ardhanarishvar form, masculine and feminine principles exist in Shiva's body, in His Sadashiva form once again He is combination of masculine and feminine attributes, and the image of Shiva Shakti as conjoined of opposite poles results in One. While researching on the project, I wondered, the reason for such deplorable state of womens of our country, when most of the popular Indian festivals are associated with goddess or Shakti-Navaratris, Durgasthami, Vijayadashami and even during Deepavali, the festivals of lights, Kali is worshipped in eastern India. Surprisingly in a country where goddess is so admired, people are killing female fetus. Isn't it a strange phenomenon for a region and religion, which discovered Divine Energy in the female form? Sad to watch female infanticide, dowry deaths, ill treatment of women. Strange and tragic for a country where women were regarded as goddess. Shakti before the emerges on the earth dies in her mother's womb. This can never be mother's decision but the decision of the entire society where girls are still considered as burdens and are unwelcome. Hope my book will change the mindset up of those compatriots to whom women are still considered as burdens. In Hinduism, men and women are not at war. The underlying philosophy of Hinduism states that both male and female as masculine and feminine energy are needed to sustain creation. The imbalance in their relationship disturbs the macrocosmic equilibrium. Their collective effort is needed to realize what Swami Vivekananda penned year ago, "The bird of the spirit of humanity cannot fly with one wing." Ihave studied religion from a scientific angle. Through my work I have tried to arrive at a point where science meets philosophy, literature and all arts. The exact date or origin of worshipping Shiva and Shakti may not be known to us but all of us know that the origin of eternity too is unknown. As time is immeasurable and so the space too and the conception of eternal time and infinite space cited Mahakal and Mahaksh were known to Indians ages ago. Indian mythology, religion, philosophy, and culture are synonymous with Shiva and Shakti. 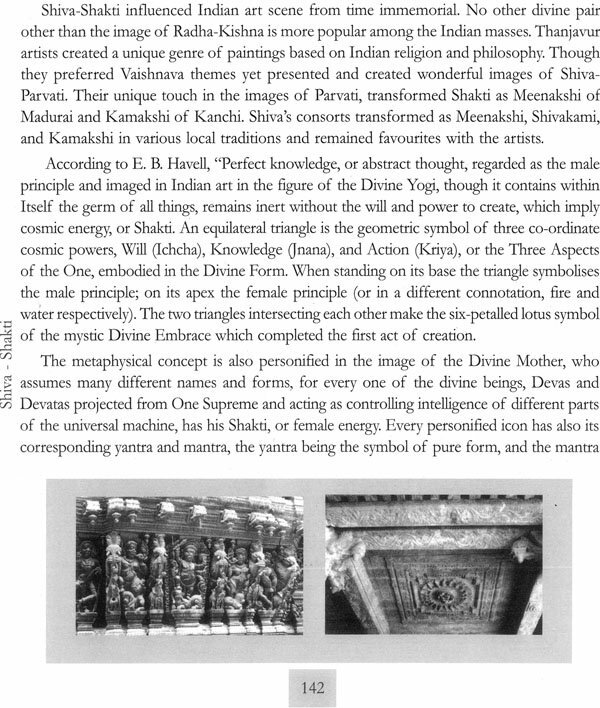 Shiva-Shakti connects entire Indian space to eternal time. Time and again, other religions tried to gain supremacy in India, but time and again they failed. 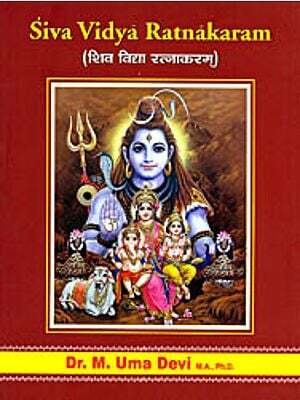 Shiva as an exponent of gandarvaveda, all arts is the master of agamas and nigamas along with His consort Shakti. Shiva-Shakti in innumerable forms will remain always as prime God and Goddess of Hindu pantheon. The series of universes appear, disappear, rise, and fall with the opening and closing of Their eyes. If He is the creator, preserver, destroyer of the Universe, She as His consort too is the partner in creation, preservation, and dissolution of the universe. 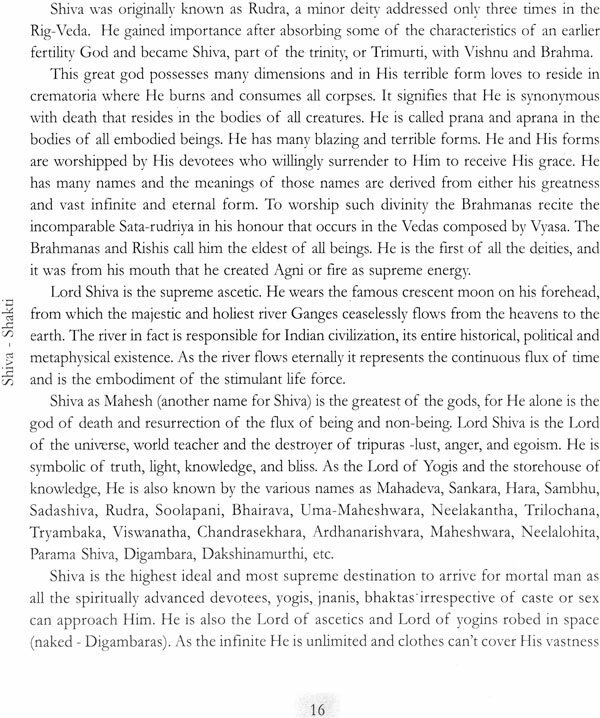 According to Skanda Purana, not a bit of the world is devoid of Shiva and Shakti. Shiva says that He sports with Parvati for sports sake. This sport is the leela, of which ordinary mortals are aware. The Divines' play is creation, preservation, and dissolution of the cosmos of which both play an equal role. Shiva-Shakti is present in everything on earth and only human beings are fortunate to worship Him and not the lesser mortals. Thus we are amritasya putra (children of immortal bliss).